Imagine a settlement of people spread over 300 acres on a bluff overlooking a broad river. Approximately 1000 people make their home here, with up to 10,000 more living close by outside the walls. There are people walking about, dressed in clothing made of hides and vegetable fiber. They decorate themselves with copper bracelets, ear plugs,and arm bands, and shell beads and pendants. They also paint their bodies. Some are working in the fields which grow crops of maize. Other are creating intricate designs on pottery. A man dressed in ceremonial garb, possibly a chief, overlooks the village from his vantage point on top of the highest mound. We are looking back in time to the a prehistoric way of life known as the Mississippian culture. The community at Moundville, Alabama, just south of Tuscaloosa, was the second largest of the great mound cities, next to Cahokia in Illinois. Archaeological investigations have produced evidence that the site was the political and ceremonial center of the Mississppian culture that thrived between from around A.D. 1000 until A.D. 1450.
Who were the mysterious people who left behind the mounds at Moundville, AL? Where did they go? Let's find out together, shall we? At this time we were full-time RVers and were traveling around the country. Moundville Alabama was not on our RV itinerary. We were camped at Okatibbe Lake in Mississippi and had decided to make our next stop an RV park in Pell City, AL. I happened to pick up a book we had bought at a used book store called Sacred Sites: Guidebook to Sacred Centers and Mysterious Places in the United States. I noticed that we would be traveling very close to the Moundville State Monument. Although I had read of these amazing mound-building peoples, I had never seen a mound with my own eyes. I then decreed that Fortuna Fourwinds, our trusty RV, would be making a detour. We arrived just after the park closed for the night, but were able to claim a spot in the small campground, which we paid for in the morning, along with our admission to the park. A circular drive makes its way around the mounds, with stopping points along the way to see such sights as the Temple or Chief’s Mound and to visit the museum. The mounds themselves are less than awe inspiring. One has to use imagination to recreate what life was like when the village was occupied. I learned a lot about these mysterious people who had built and lived upon the twenty-six mounds, twenty of which are preserved at the Archeological State Park. Grannysage makes it to the top of the Chief’s Mound. The Mound Builders belong to a class of people known as the Mississippian Culture. They were given this name because they constructed large pyramid mounds in the Mississippi River Valley and extended out into the Midwestern, Eastern, and Southeastern United States. Towns with large populations were supported by large scale farming, mainly of maize. The towns were controlled by a chief, who lived on top of the highest mound. The chief controlled both the political and religious life of the people. Many of the chiefs claimed to have been descendants of the sun god and were themselves were considered divine. When a chief died, his wives, children and servants were often killed as well so that they could join him in the afterlife. It should be noted that theories regarding the history of the Mississippians have changed over the years. It used to be thought that an invisible, unknown race created the mounds and then disappeared. Now it is known that they were ancestors of the modern tribes, particularly the Choctaw, Creek, Chickasaw, Cherokee, and Muskogee tribes. A pocket guide to Moundville. Illustrated with 50 color photos, maps, and figures, it is a good book to read before visiting Moundville.or refresh you memory after you leave. Preview of a video that explores the beliefs of early European settlers that the mounds were built by a vanished race. As I mentioned earlier, just looking at the mounds is less than awe inspiring until you can grasp some idea of the daily life of the Mississippians. A trip to the Jones Archaeological Museum is a must if you are visiting Moundville. Renovated in 2010, the theme of “Lost Realm of the Black Warrior.” immerses the visitor in a life size diorama of what life was most likely like for the Moundville residents. Scattered about the displays are artifacts that were discovered during archeological digs at Moundville that tell us more about this fascinating culture. Many of the objects found in the burial mounds include axes, maces, and other weapons which indicate that warfare was part of their lives. The wooden palisade that was built around the city also indicates a need for protection due to the constant shifts in power that occurred during that time. Other artifacts provide some indication of the spiritual beliefs of what has become known as the Southeastern Ceremonial Complex. The image shown above is of the Rattlesnake Disk, a ceremonial stone palette found by farmer in the 1800′s. It is believed that these palettes were used to grind pigments, probably for body decoration. The motif on the Rattlesnake Disk shows two serpents entwined together. This is probably a representation of the Great Horned Serpents which are mythological creatures of the underworld. They are usually described as huge, scaly creatures with horns and long teeth. As supernatural creatures with great power, they were both respected and feared. 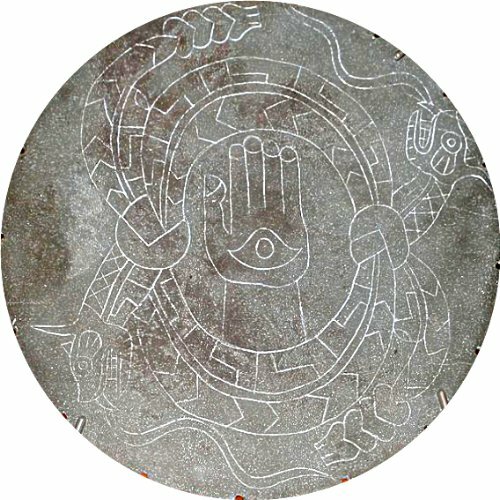 The Hand and Eye motif in the center is another common symbol in Mississippian Culture and it is speculated that it might represent a portal to the other-world, a path of souls, that one must travel after death. Of course, we may never know what these images truly represented for there are no written records, only stories handed down through the ages to today’s Native tribes. In this video you will get a short tour of the Jones Archeological Museum where you can some of the artifacts were discovered, the life size displays, and descriptive wall murals. W. Michael Gear and Kathleen O’Neal Gear are well known authors of novels of prehistoric America. They base these stories on extensive research and made a trip to Moundville. They discuss the two novels based on the Moundville site in this video. "Think not of Moundville as quiet and dead, but alive with multitudes dressed in their best, faces painted in bright colors. Hear thousands of voices, shrieking children, barking dogs, and the distant sound of drums and flutes. Smell the musky wood smoke, the scent of cooking corn, fish, and venison. Only then will Moundville live." After reading People of the Weeping Eye, I couldn't wait to read the next book in the stories. This book continues the story of the People of the Weeping Eye. A book by Daniel A Smith about what happens to the people of the mounds after Hernando de Soto and his conquistadors trampled through their lands. Chunky player figurine photo is in the public domain. Chunkey was a game played by the people of the Mississippian culture. The players would roll disc shaped stones across the ground and throw spears at them, attempting to place the spear as close to the stopped stone as possible. This game was described in great detail in the books by the Gears. Between 1300 and 1450, the great city of Moundville would gradually decline, with most of its people leaving the city. It became more of a ceremonial area with the mounds mostly used for burials. There are several theories about why this occurred, although no one can be absolutely sure. Initially it seemed that these mysterious people just vanished, leading to the alien theory. Now we know that they simply moved and evolved into the tribes we have today. It is certain that they did not fall prey to the diseases of the Spanish Conquistadors led by de Soto for Moundville was already deserted when they arrived. Perhaps there was a drought or the land had been over-tilled and they could no longer grow crops. Perhaps warfare drove them away. The theory I like the best is the one put forth by the Gears in their books about the area. In the story they presented, the people found a way to live in harmony with their neighbors, making the city and its palisades unnecessary. The people then gradually drifted away to live in smaller villages and farms, using the Moundville site mainly for the ceremonies and to bury their dead. Photo of grannysage climbing the steps to the Chief’s Mound. For some reason vultures like to follow me. I guess they hope that I will become their next meal. After visiting Moundville, climbing to the top of the fifty-eight foot chief’s mound, looking at the displays in the museum, and reading the two books written by the Gears, I felt I had some understanding of the lifestyle of the people who lived at Moundville. Yet something was lacking. I couldn’t touch their spirit. I wanted to feel what it was like to walk in their moccasins. Some months later as I was sitting in our RV which was parked in a national forest, I felt called to visit Moundville once again, only this time as a shamanic journey. I readily admit that much of what I saw was influenced by the stories I read. Even so, there is a message for the people of today from those who lived before, for those who choose to listen. These journeys of mine are always made during a light trance in which I am awake, yet aware of what some would call an imaginary world. After years of experimenting I have found that I can influence the scene to a certain extent, but some things refuse to be altered. It is during these times that I receive the most compelling messages. When I began this session I saw myself in the body of a middle-aged woman who was being carried to the city of Moundville in a canoe. The drums were beating to announce her arrival and she was met at the canoe landing by representatives of the Chief. The woman was accompanied by her daughter, Pear Blossom. I found this to be rather odd because I usually retain my own identity when I take these journeys. The answer was revealed shortly thereafter, when the woman climbed the many steps to the top of the chief’s mound. Remembering my own arduous trip up the same slope, I appreciated the stamina of those who traversed them every day. I was somewhat fearful about meeting the Chief, for that person in the books had been corrupted by the trappings of power and prestige. I soon learned, however, that this chief was known to be kind, thoughtful, and generous, and was well loved by his people. The chief, whose name I learned was Strong Bear, greeted the Matron (the title of the position she held in her village) and her daughter. He explained that he had learned that her husband had just died and he had called for her to propose an arranged marriage between his son and her daughter. Pear Blossom did not appear to be shocked at this; in fact she did not demonstrate any emotion whatsoever. Photo is of a replica of a Moundville chief which is on display at the Jones Archeological Museum. The chief offered to show them around the city, but Pear Blossom declined, claiming the need to rest. It was while the chief and the Matron were standing on the edge of the mound, looking down at the people down below, that found out I how I had really gotten there. I must say I was surprised to hear this myself, for I had no memory of how I had made the journey back in time. But the chief did not seem the least bit concerned and welcomed me on the tour. After we descended the stairway again, he took me to meet the High Priest, who was able to look within the Matron’s eyes and see my spirit looking back. The High Priest also made me feel welcome and encouraged me to ask any questions I might have as we walked along. Obviously this society had experience with the metaphysical world for them to take the revelation of my presence so lightly. We started the tour at a tall pole which stood in the center of the plaza which the Chief explained represented the spiritual center of their world. From there he led us past the council house, which stood on its own mound, and pointed out granaries were filled to overflowing with maize. He spoke proudly of how the people grew crops on their farms and brought tribute to the city in return for protection from enemies. When I asked if these people were slaves he replied that they were not. Their relationship seemed to be similar to the serfs and lords of medieval times. Definitely, the farmers where subservient to the elite. We also passed some strange wooden structures in the plaza. When I asked about them, I was told that prisoners of war were suspended from these racks allowing the townspeople to harass and torture the prisoners until they died or were executed. I asked if war was common and the chief replied, “Yes, of course. We are surrounded by our enemies. They would love to take advantage of any weakness we show, so we must retaliate whenever they attack us or our outlying villages.” I wanted to make a comment about this, but realizing that in my own century, war, torture, and terrorism continue to exist, I did not feel I had the right to make judgements. Soon we passed on to the area of the craft clans, those who fashioned beautifully decorated bowls and woven baskets, some of which have been unearthed during archeological digs in our own time. Because of the surplus of food, the people of the mounds had time to perfect their art, which was in high demand up and down the trade route. 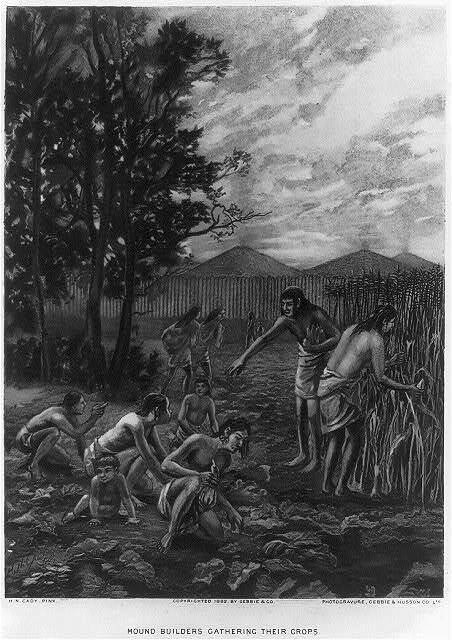 Image of a group of mound builders gathering in their crops. Notice the child playing next to them.Source: The Library of Congress. Drawing of the “lusty husband” and his wife from U. S. History Images and is in the public domain. The chief then introduced me to his two wives, with whom he had many children. The first-born son of his first wife was the one being offered in marriage to Pear Blossom. As he had many other duties, he left the Matron and I with the women for a time. When I asked the wives if they minded sharing their husband, they looked at me in amazement and giggled. I confess to being curious about the menstrual hut, something that we modern women feel too independent to ever require. I asked to be allowed to visit one, and with more giggles, we were escorted to a hut that was currently being occupied by one woman. She was working on some embroidered moccasins and the Matron commented on her skill. She then explained that she would like to ask some questions from her spirit visitor and the woman agreed, although somewhat hesitantly. Not everyone, it appeared, was comfortable talking with spirits. I asked her if she minded being forced to separate herself from the rest of the village each month and she laughed. She said that she looked forward to this time away from the daily chores and child-rearing. It was a time for thinking, conversing with friends if they were sharing the hut with you, or just napping and dreaming if you liked. I had to admit I felt very comfortable sitting in the hut with her. Although it was warm outside, it was cool inside and I had no desire to leave. Even though I am a lifetime feminist, I think that we modern women have done a disservice to ourselves by insisting that, because we are equal to men, we are the same and should be allowed to live as they do. We should instead insist on the return of the menstrual hut, not to protect men from the power of our moon cycles, but to reward ourselves with a regular time to nurture ourselves. Reluctantly I left the hut, for we were told the chief had prepared a feast in preparation of a possible marriage announcement. The Matron had not yet agreed to this, but something told me this was a done deal. Indeed, that was the case, for Pear Blossom made not a murmur when her mother stated that the marriage between her daughter and the chief’s son was acceptable. I wondered at this, but was told that every girl dreams of the opportunity to raise her status by marrying well. She would soon be wealthy and powerful, and who wouldn’t want that? Marriages arranged for political reasons are not unknown in our own time, although less common than they were some decades ago. For a delightful story from a Native American perspective about how a woman's moon-time came to be, read "The Gift From the Moon" by Nicholas Noble Wolf. 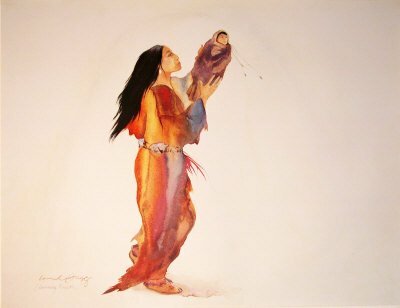 He states, "Most, if not all traditions of Native American spirituality hold moon-time as a sacred time of purification during which women do not go into ceremony or use sacred objects such as pipes and feathers. Often people from Western culture see this as a disrespectful and negative stereotyping of a woman's menstrual cycle. We traditional people do not see it this way, as moon-time is a place of honor and beauty." During the feast I noticed that all the babies were quiet. In my world, I said, babies seem to be always crying. They are put to bed and we say it is good for them to cry themselves to sleep. We insist they follow our schedules and get upset when they cry and fuss when tired or hungry. We create marvelous toys to keep them busy, hoping for a bit of quiet time in between bouts of crying. The people of the mounds were amazed at this. “We cherish our children. A mother will nurse her child for several years, and carry it with her wherever she goes. If she is busy, another lap is always available. I was asked to describe the future. How difficult that is when the words to describe it don’t exist yet. I mentioned that we would invent a way for people to fly in the sky, and people would walk on the moon (while I was saying that I remembered the Hopi Prophecy of the eagle flying to the moon and wondered if another time traveler had implanted that idea). I mentioned that we had medicines that cured many diseases but the one thing that we had lost is our love and appreciation for Mother Earth. I told of water that was not clean enough to drink and land used to bury the garbage we had created. What astonished them the most was when I told them that they themselves would be forgotten and the mounds they lived on grown over, until some enterprising explorer discovered them. I told them that efforts would be made to preserve the mounds and people would come to look at them and wonder, as I had, what kind of people had lived there. I then asked the Chief if he had a message to send back to the future. This is what he said, and I leave it to the reader to decide whether it has meaning or not. “Tell the people at a far off time that change is inevitable. We know from our own histories that civilizations rise and fall. Others grow up in their place. Our own prophecies tell us that at some point we will no longer need the palisades to protect us and we will be dispersed. But also tell them that we have not gone away. All they need to do is look at their brothers and sisters, those who have descended from us, although we do not know their names. They carry our blood and hopefully some of our stories. We will still be here, although you cannot see us and we cannot see you. Remind them that the Breath Giver gave life to us all. It is up to us what we make of it. We who live here have choices, choices we make every day. We experience love, and hate, passion and grief. There are some of us who are drawn to power and evil deeds. They covet wealth and will do whatever it takes to get it. Others are likely to give you everything they own to make sure your needs are met. Although we will protect our city from enemies, we also love to play games and gamble. We love pretty things and trade for things we are not able to obtain for ourselves. Tell your people to remember us as a complex society, neither good or bad, but a combination of both. We are people who celebrate life but are not afraid of death. We know that some day we will all give up these garments made of clay and travel through the portal, along the path of souls, to the place of the dead. 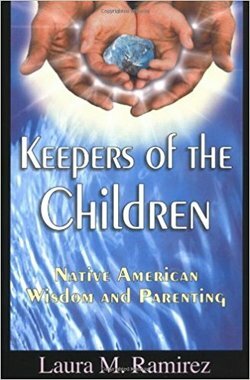 The author is a white woman married to a Native American, who draws on Native American wisdom to raise emotionally healthy children.. The Moundville site, occupied from around A.D. 1000 until A.D. 1450, is a large settlement of Mississippian culture on the Black Warrior River in central Alabama. At the time of Moundville's heaviest residential population, the community took the form of a three hundred-acre village built on a bluff overlooking the river. Southeastern Literary Tourism Initiative: Moundville Story "Digging Up Bones" Wins Nation's First Tourism Fiction Writing ContestThe Inaugural SELTI Writing Contest was the nation's first competition that challenged writers to compose short stories designed for directly promoting tourism. The contest guidelines established the setting of the stories as the historic Native American city of Moundville. "The Mississippian people who constructed the monuments at Moundville, just outside of Tuscaloosa, believed that human beings trod the earth on a crust between the World Beneath and the World Above, moving in a universe full of living spirits." What Are Your Thoughts About the Moundbuilders? Have you visited any of the many mounds that are scattered around the eastern part of the United States? Do you have any theories about what became of them? Have you read any books by W. Michael Gear and Kathleen O’Neal Gear? You can tell me your thoughts at my blog post Moundville Mysteries.